Like many Canadians and North American, I discovered and fell in love with the Berger Picard breed (or Picardy Sheppard) with wonderful pictures found in a professional photography dog book about 10 years ago. At that time, there was no active breeder of Berger Picard in Canada. In 2009, we were ready to expand our canine family. After some research, Édouard de la Picardie and Emmylou de la Vallée d’Ottawa joined us within the same month of October. Such a great adventure! When visiting the Berger Picard breeders, we finally were able to see and pet « real » Berger Picards! What a pleasure for the eyes and the heart! We were able to confirm that this beautiful breed was compatible with our lifestyle. In June 2012, we flew to France to bring back Hally Berry of Clos d'Aria, a beautiful and wonderful fawn puppy girl. In September 2013, we flew back to France to attend the Nationale d'Élevage in Altorf. Over 125 Berger Picards were shown! Such a great experience and so many beautiful memories. 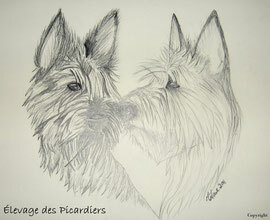 I love dogs but most of all, I love Berger Picards! It is a rare breed which is still very little known in Canada. This is one the reasons why we want to share the pleasure of living with these great dogs and promote this rare breed. Our goal is simple: produce registered Berger Picards in respect with the breed standard and with sound temperament. Our dogs are tested for hips and elbows dysplasia (OFA or PennHip certifications) and are also seen by an ophthalmologist veterinarian to obtain a OFA certificate. They are registered with the Canadian Kennel Club. There is very few Berger Picard breeders in Canada. You should expect to be put on a waiting list when applying to adopt a puppy. Being a Berger Picard breeder is something we take very seriously. « Adopting a pet is a lifelong commitment ».